I'm always hesitant to post something that involves me personally because of conflicts of interest, but CNET has posted a pretty cool news article about why hobbyists hack TI calculators. The story focuses on Brandon Wilson, Dan Englender, and myself. The highlight is the second photo, where you can see Dan Englender's incredible stash of calculators and calculator-related equipment. But most importantly, articles like this are raising awareness of TI's DMCA abuses and presenting the TI community to the rest of the world in a positive light. We have now covered most of the major technology news sites with our story, highlighting the spirit of the sharing of knowledge and intellectual challenge which makes the community so great. By simply telling our story as it happened (and by TI's repeated refusals to comment on any of these news stories, which is revealing in itself), we have completely won the battle of public opinion! A note, in the sake of correctness: I never said to the reporter that I was "the news editor" (he took that from the staff page), but since I've continually been posting news here and there, I never really was able to retire anyway. I'm just no longer the *only* news editor. Duncan, Travis, and all the other fine ticalc.org staff will continue to handle many of the news articles and I'll post occasionally. I also have found myself rewriting Emu8x for 81 emulation support and 18% speed increase...so much for having no time :-). Once you join the community, the only way to leave is death it seems. This is really cool that this is spreading like it is. The only thing I think they could have worded differently would have been changing hacker to programmer.. But otherwise, was an interesting read. Hopefully such articles can bring some fresh blood into the community! Too bad that article only focused on the TI-83+, the 68k models are soo much cooler! Thems are fightin words sir. Personally, I like the TI-86 the best. It IS a pity. 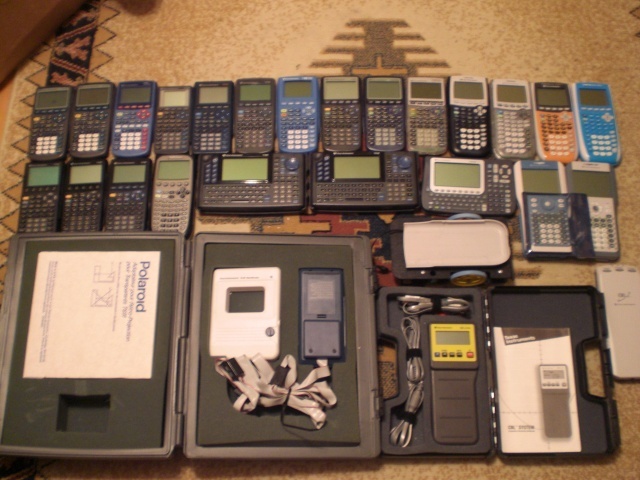 I myself only have 68k calculators at home. I think you mean "than", not "then", in which case I agree. However the 83+ series is great. I'm glad this is gaining attention. Texas Instruments should not be terrorizing high school students. I don't think that any of the DMCA'd individuals are still in highschool, but in any event, I agree. It's really a shame they decided to be asses in this situation. Yeah. It's really a shame that such an innovative company is having its image tarnished because a bunch of combative lawyers couldn't keep themselves in line. This just gets uglier the more it drags out. Had I known we were submitting pictures of our stashes, I would have submitted mine (see URL). QUOTE: I think you mean "than", not "then", in which case I agree. However the 83+ series is great. Anyway, great to know that the world is actually interested in us! I didn't know they made the TI-84 plus SE in different colours (except for the keyboard overlay)? Does anyone know where Dan Englender went to college? I'm curious what school would have freshman that recognized the name of a calculator hacker.